WORLD PREMIERE RECORDINGS OF LOST BERLIN MUSIC! featuring Bernadette Boerckel, soprano; Daniel Marcus, tenor; Edward Pleasant, baritone; with Heather Hill, soprano and Thomas Carle, tenor. “Everybody’s Doin’ It Now” (turkey trot, 1911). “I Love a Piano” (song from Stop!Look!Listen!, 1915). “Tell Me, Little Gypsy” (from the Ziegfeld Follies of 1920). “Play A Simple Melody” (duet from Watch Your Step, 1914). “Nobody Knows (and Nobody Seems to Care)” (fox trot, 1919). Overture to Watch Your Step (1914). “Say It With Music” (theme of Irving Berlin’s Music Box Revue, 1921). “Smile and Show Your Dimple” (one-step, 1918). “My Melody Dream” (A Song Poem, 1911). “When I Lost You” (waltz, 1912). “This Is The Life!” (comic song, 1914). “A Pretty Girl Is Like a Melody”” (theme of the Ziegfeld Follies of 1919). “Alexander’s Ragtime Band” (ragtime song, 1911). “You’d Be Surprised” (song from the Ziegfeld Follies of 1919). “That Mesmerizing Mendelssohn Tune” (song, 1909). “The Girls of My Dreams” (from the Ziegfeld Follies of 1920). “The International Rag” (comic duet, 1913). “When I Leave the World Behind” (ballad, 1915). “Finale to Act II” (“Opera Medley”) from Watch Your Step (1914). which runs over 10,000 words, is as rewarding as the disc is enjoyable. “Benjamin’s Paragon Ragtime Orchestra swings nicely in clean lines under his lively direction, and the vocal soloists share a similarly old-fashioned quality…. 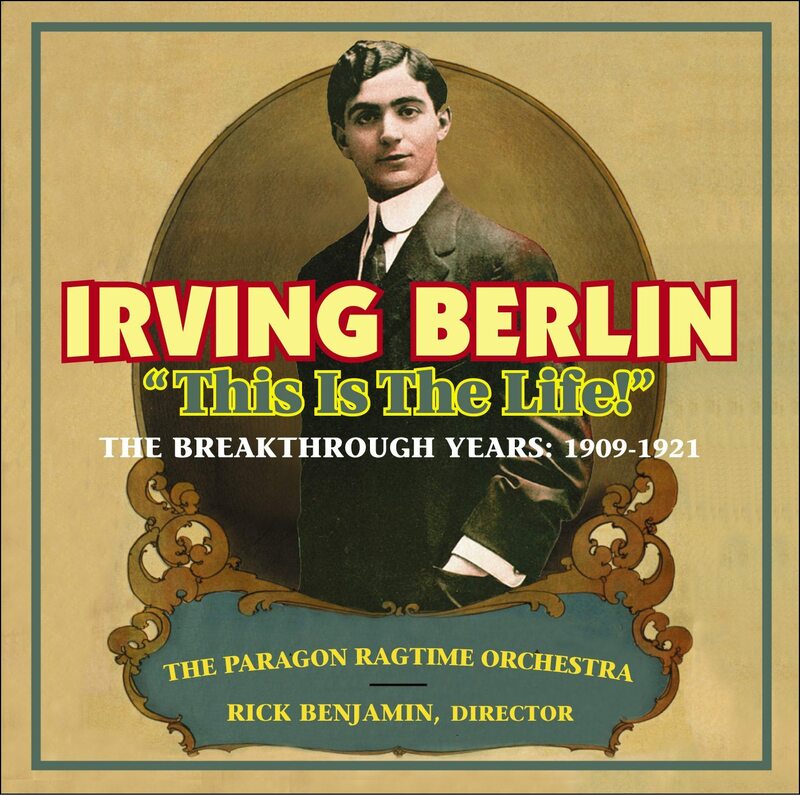 Songwriter Irving Berlin (1888­-1989) remains an American cultural icon. His extraordinary genius took him on a journey extending from the birth of the pop music industry (“Tin Pan Alley”), to the stages of Broadway and into the hearts of millions through the mediums of radio, movies, and television. Over six decades, Berlin’s 1,500 songs became the virtual “soundtrack” of 20th century American life. While Berlin’s classic middle- and late-period works are still known and loved around the world, the music that launched him as “America’s greatest songwriter” in the 1900s and 1910s is now forgotten and largely unavailable. Yet from an historical perspective, these early years are Berlin’s most fascinating and perhaps, most important: through them, Israel Isidore Beilin – an impoverished immigrant who spoke no English and never studied music – transformed himself and the face of American popular song. As “Irving Berlin,” he became an extraordinary commentator on our national life and in a breathtakingly short time was making his own considerable influences upon it. Produced by Judith Sherman, the current Grammy Award winning “Producer of the Year – Classical,” THIS IS THE LIFE! is sure to delight.